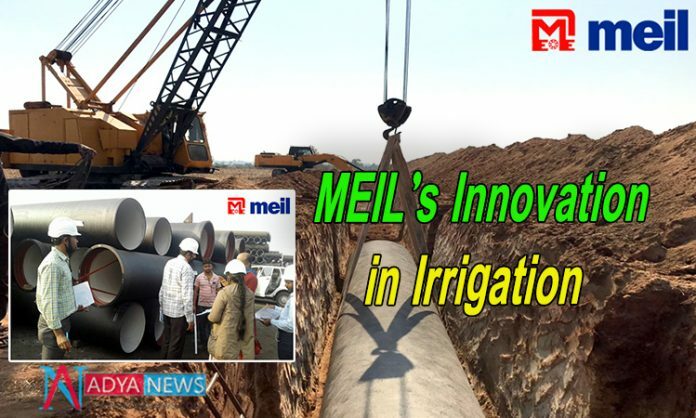 The Engineering major Megha Engineering and Infrastructure Ltd (MEIL) has taken up a unique innovative irrigation system in Telangana as part of the gigantic irrigation project Kaleshwaram Lift Irrigation Project (KLIP). Explaining about this innovative project Mr Bonthu Srinivas Reddy said that “It involves piped water supply to the end user to avoid water from not to be evaporated or sinks into the soil. It does not require even the land acquisition to this new piped irrigation water supply.” He further said “This innovative piped irrigation system is already successful in many countries. Some states include Madhya Pradesh, Rajasthan and Gujarat states are implementing this piped irrigation on a small scale. Telangana government initiated this irrigation system in large scale to supply water for 80,000 hectares.” The Telangana Government taking all appropriate steps to accomplish its objective to supply irrigation water to one crore acres of farmland. Israel’s Outlet Management System(OMS) will be implemented in this project the first time in Asia. This project is known as KLIP package-21 or the Kondam cheruvu project. The advantage with OMS is water neither evaporates nor sink into the soil. Laying of the pipelines may obstruct the peasants initially, but thereafter they can be cultivated above the pipelines as normal. This project will interlink the Kondam cheruvu and Manchippa cheruvu with the pressurized pipeline. The project includes 6,129 kilometers of the pressurized Pipeline system, with the combination of MS, DI and HDPE pipes and the construction works of the pipeline network works are already began with an extensive pitch. MEIL completed 11.4kms MS pipeline work out of 150 km and also completed 10kms of DI pipeline work out of 282 km. After completion of this project, 46,000 hectors of land in Metpally area will have plentiful water for irrigation. Another 34,000 hectors of land in Nizamabad rural, Balkonda, Armoor will get water from Gadkol pump house. MEIL is constructing a reservoir with a capacity of 3.5 TMC of water near Gadkol in Nizamabad district. MEIL will also take up the pumping work, and also constructing two pumping stations, one at Metpally with ten pumps having a capacity of 2.5 megawatts each. The water will be drawn from the pump house, to be set up on the Nizamsagar canal 14.4kms away. The second pumping station at Gadkol with 8 pumps with a capacity of 2MW. The pumping stations designs are at the approval stage. Irrigation experts expressing the view that, water wastage can be effectively controlled entirely through the piped irrigation is the only solution. With piped irrigation schemes water can be supplied to every last ayacut and also can enhance the farm productivity, they added. The Government officials are figuring out that, after a successful implementation of this innovative project, it can be brought in to new areas.